Rev. Lois is a full time chaplain of the Department of Spiritual Services at the University of Iowa Hospitals and Clinics with primary responsibility in the Children’s Hospital. She is developing a broad spiritual care skill range in the areas of emergent, trauma, palliative, ICU, behavioral health and general medical care for adults, children, babies and families. She also brings her background as a religious education director in developing Spiritual Services programs and resources, among which are a midweek meditation series in the Stead Family Children Hospital Meditation Room. As our Community Minister, Lois shares of her ministry and knowledge of spiritual care through sermons and workshops, and is available to offer pastoral care to members in the hospital. This mutually beneficial affiliation offers members opportunities to share our mission and connect with a larger ministry – not only in support of Lois, but with involvement in various ministries at the hospital, like singing and prayer shawl ministries. Rev. Lois has a long history with Unitarian Universalism. 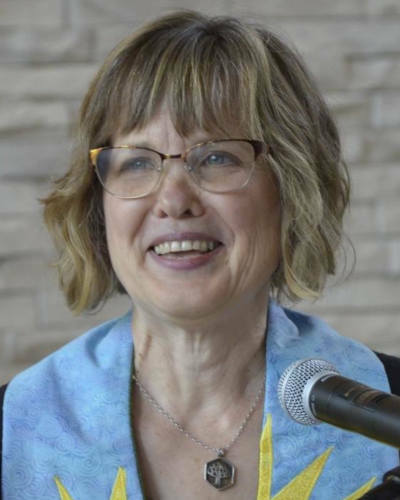 She served as Lifespan Director of Religious Education for the then Unitarian Universalist Society of Iowa City from 1999 – 2014, during which time she discerned the call to ministry. In May 2018, the Unitarian Universalist Society ordained Lois into Unitarian Universalist ministry after she received her M.Div. from Meadville Lombard Theological School and successfully met the qualifications to begin her ministerial credentialing process and Fellowship with the Unitarian Universalist Association. The UUS now supports Lois in her three year credentialing process through affiliation, a requirement of UU ministers working in a community setting, and involvement in her Ministerial Formation Team. Lois has a MFA in fiction from the Iowa Writers Workshop and plenty of old writing projects for her spare time. She frequents coffee shops, art museums, enjoys the outdoors, is committed to a vegetarian lifestyle with her partner Andy Douglas, and together they make many a good stir fry.